You’ve heard about it for years. Now, you want to get a business VoIP system for your company. It’s a sensible move. With so many world-class business VoIP providers available, where should you place your custom? Which business VoIP provider really understands what a modem business needs? We compare 2 leading providers head-to-head for you. We compare the 4 most important aspects to business VoIP; What are the basic features and how much do they cost? What’s the pricing model like? Does it integrate with your mobile, laptop, and PC applications? How good is their customer support? When you switch from a traditional, old-fashioned landline provider to a business VoIP provider, you’ll be startled by the difference. Just 10 years ago, these basic features would have needed a massive piece of hardware and would have cost you tens of thousands of dollars. A recorded greeting gives you options to connect with various lines, it saves you time and the need to employ a member of staff to transfer your calls. 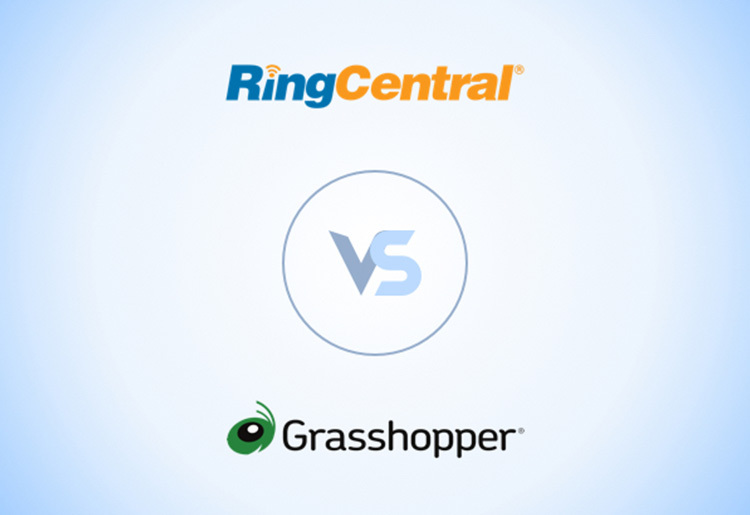 RingCentral and Grasshopper both offer this feature for no additional cost, and score a point each in this round. We love this feature. It allows you to route incoming calls to wherever you are. You can change the destination phone by time and date, meaning that the calls can be routed to whichever team member is working. Great for shift work. Both providers see this as an essential features and provide it for free in their packages. That’s another point each. Additional cost $0-$0. An 800 number can add as much as 30% more volume to your inbound inquiries. For many businesses, it’s an indispensable inbound marketing tool. Both providers charge a monthly fee for an 800 number. Grasshopper charges 6c a minute on top of the tariff, but more expensive options with inclusive minutes are available. Score draw for both companies on this one. Additional cost $39.99-$12.95. Ideal for offices where different co-workers have different skill sets. Are you the CEO with someone on the line about a product delivery? Transfer the caller live to your dispatch manager. Both companies offer it for free as part of their service. Sometimes, it’s just not a good time to get a call. There’s nothing worse than being interrupted when you’re on vacation. Do Not Disturb means you can re-direct any incoming calls to your voicemail or to the switchboard. There are even behavior settings for whether the call is internal or external. RingCentral offers DND but Grasshopper does not (although you can achieve something similar with its call screening function). There are 5 of you in the office but it’s only ever the main line that takes incoming calls. Call queueing solves that. Instead of hearing a busy tone, your customers get answered automatically and held in a queue, letting them know how long they can expect to wait. Grasshopper offers the service but it’s fiddly; you can’t do it via the control panel. This provider offers unlimited extensions at $12 a month which you can then try to set up call queues. Call queueing is included free with RingCentral’s proposition. Additional cost $14.99-N/A. It’s another win for RingCentral. Faxing may be dying out but it’s still important for many businesses. Both companies offer a service where any faxes sent to you are converted to an image or a PDF and emailed to your nominated inbox. It costs $7.99 on RingCentral but it’s free of charge on Grasshopper. A clear Grasshopper victory on this score. Additional cost $7.99-$0. A very clever and intuitive system. Let’s say that you can answer your phone at home, at work, or on your cell. If someone calls your VoIP number, all 3 will ring at once until you pick up. Or you can get FollowMe to hunt you. Direct it to your office phone first. If there’s no answer there, send it to your cell. If you don’t pick up your cell, it’ll ring your home phone. Whichever way you do it, if you never pick up, send the call to voicemail. You can match FollowMe to find a co-worker by their activities and location. It’s available for free on both services. A good one-all draw on this feature. End of round one. A full score for RingCentral but only 6/8 for Grasshopper. RingCentral may be more expensive, but its superb technology makes it the clear winner. RingCentral is more expensive with all the basic features but it offers better, more flexible technology than Grasshopper. How do the two companies compare with their general pricing? Both are good. They’re both market leaders so that’s something you’d expect. RingCentral charges customers in tiers. They offer 3 options ranging from $24.99 to $44.99 a month. The packages include anywhere between 1,000 and 10,000 toll free calling minutes per month. They also offer handsets on lease, starting from as little as $20 per month per unit. Grasshopper states on its website that the service "works with your existing mobile and home/office phones so you never have to purchase, install, or maintain expensive phone hardware." There is no handset purchase option. Grasshopper is right to point that out. Why try to sell unneeded equipment to VoIP users? Particularly if it can be used on existing handsets. However, for many, it’s the choice that’s important. What about Grasshopper’s monthly fees? They start at $12 a month with no minutes, stepping up to $24 a month for 500 inclusive minutes to $49 for 2,000. That’s much less generous than RingCentral’s offer. It’s easier (and often cheaper) to get everything from one place, and the pricing is more generous. That’s another win for RingCentral. Customer service is a crucial aspect of business VoIP providers. Trust us when we say that there’s no frustration like a misbehaving business VoIP connection, and no customer support to back you up. RingCentral offer 2 tiers of support. For single-handset customers, you can call or email between 5am and 6pm Pacific Time. That service is 24 hours a day for customers with 2 or more connections. They’ve put a very helpful online learning centre on the site for customers wanting to familiarize themselves with everything RingCentral can do. A specialist can also do a personalized demonstration of a product if you like as well. Grasshopper offers a 24/7 service for all customers. It’s toll-free, as you’d expect. The site has extensive and helpful Knowledge Base and FAQ systems, and theres an online ticketing system too, which is great for detailed problems. Both are great offerings but Grasshopper has to win this one. We live in a connected world where computers can speak to phones and phones speak to computers. More and more, integration with mobile and desktop apps is crucial for companies. On all RingCentral packages, there’s integration with Microsoft & Google products as well as Box and Dropbox. You have to subscribe to a higher tier to access Salesforce, Zendesk and Desk.com functionality. Grasshopper offers no real functionality with office productivity tools. For many companies, this could be a big sticking point. Both companies have Android and Apple apps. This allows you to use your VoIP connection on the go. That’s particularly useful for WiFi hotspots. That's another victory in this case for RingCentral. These are both very well established companies but there are glaring differences in what they bring to the business VoIP marketplace. Grasshopper’s technology and service, although great, seems a good way behind RingCentral’s. The service has fewer features than RingCentral and we’re disappointed that there’s no option to be out-of-the-box-ready VoIP phones from them. To learn more about either of these providers or any other major Business VoIP provider, check out our in-depth reviews.